The killers made a hurried exit from the park. In Dublin they would leave a card into all the major newspapers identifying themselves as the Irish National Invinicibles. 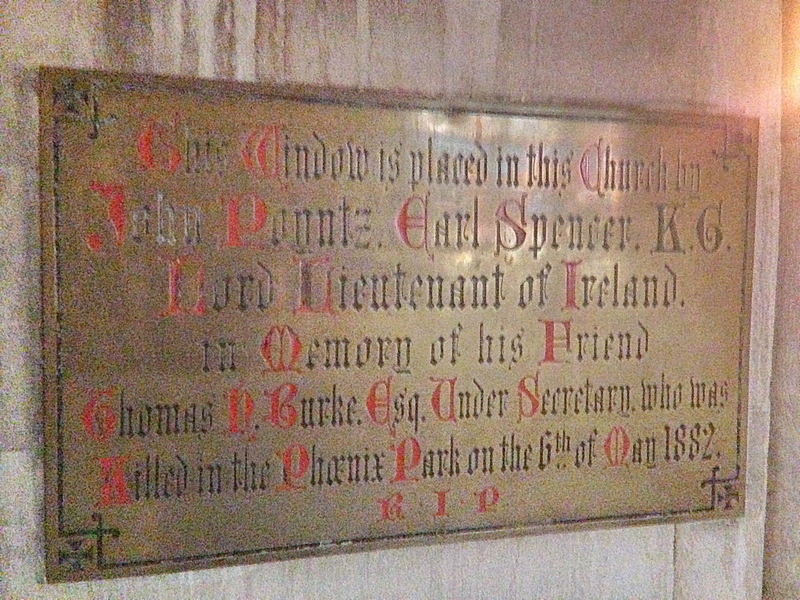 This Plaque was erected by Earl Spencer (1835-1910) in St. Saviour's Church, Dominick Street, Dublin 1. Himself and his parishoners paid for a stained glass window in remembrance of this dark day on which his friends lost their their lives. On is arrival to Ireland on 6th May 1882, the chief secretary for Ireland, Frederick Cavendish, after attending business in Dublin Castle, walked home to his residence in Phoenix Park. He met on his way Permanent Undersecretary Thomas Henry Burke travelling in a cab. Burke then joined Cavendish on his walk. The two men were approached and surrounded by seven men and in a brutal assination were stabbed to death with surgical knives. The killers made a hurried exit from the park. In Dublin they would leave a card into all the major newspapers identifying themselves as the Irish National Invinicibles. For the first time in history there would be sunday editions of these newspapers. A major police investagtion took place where they were known to be guilty but had no evidence against them to be prosecuted. Following further attacks The Invincibles were eventially tried in Kilmainham Gaol. Five of these men being Joseph Brady, Daniel Curley, Michael Fagan, Thomas Caffrey and Timothy Kelly were executed by the famous hangman, William Marwood, who had been transported to Dublin from Britain to carry out Kilmainham Execututions.